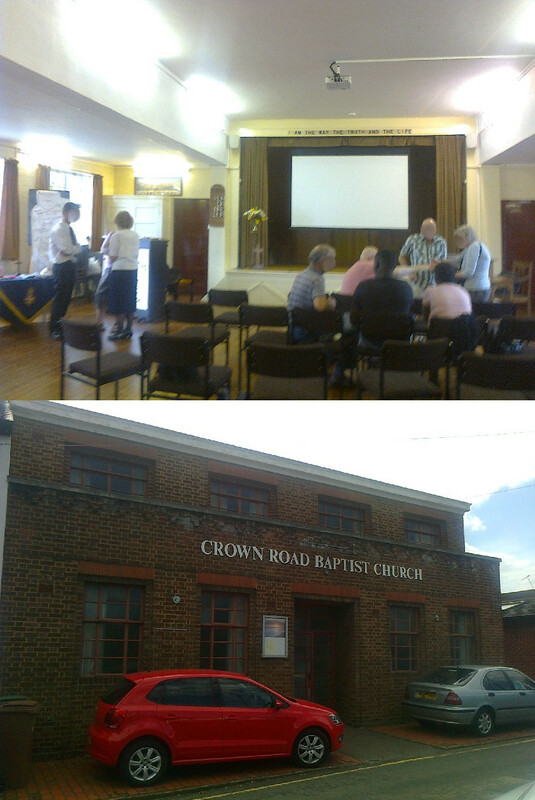 The Baptists in Sutton worshipped in a meeting room from 1862 until 1883, when a church was built in the town’s high street. This was used until being demolished in 1934, upon which the congregation moved to the current building (that only took six months to build), which opened in September 1934. The church was designed by Nugent Cachemaille-Day (1896-1976). Although the architecture is modern, it has some noticeably Gothic influences, for example in the high pointed windows. The interior is more richly decorated than other Baptist churches I’ve been to. Two of the windows – the one at the front, and one at the side with a plaque dedicating it to members of the church who died in the Second World War – have stained glass with images of Christ, angels and saints. Underneath the front window is a bas-relief depicting the Great Commission (Matthew 28:19-20). There is no altar where one would usually expect to find one, although there is a table at the front of the church that was used for communion. Instead, right at the far end of the sanctuary is a large font for baptisms. A large pulpit is on the left-hand-side at the front of the church, but was not used during the service that I attended. A wooden cross hangs down over the sanctuary, and there was also a display of flowers at the front. The service was taken by a male minister in a suit and tie. He spoke very well during the sermon, and introduced himself to me after the service. The Bible readings were given by a man from the congregation. There were roughly forty people in the congregation when I visited (although, being August, there may usually be slightly more). There were slightly more females than males, and roughly a quarter of the congregation were of an ethnic minority. In terms of age, most of the congregation were middle-aged or young adults, although there were several children and elderly people. They were all very friendly, many of them approaching me to welcome me. The service began at 10:30, with the congregation standing as the Bible was brought into the sanctuary from a back room. After a welcome and a moment of silence, there was a responsorial call to worship, followed by the first hymn. The words were printed on the service sheet. After prayers, including the Lord’s Prayer, the minister gave a talk on the subject of picnics, leading on to the subject of the feeding of the 5000. After another hymn came the Bible readings, John 6:1-15 (the feeding of the 5000) and 2 Kings 4:42-44 (a similar event in the ministry of Elisha). The Bible readings were given by a gentleman who came up from the congregation, and were followed by the sermon. I found that the minister’s sermon was very good, speaking about the feeding of the five thousand (although he did seem to conflate it with the later feeding of the 4000) and talking about how those who seek to explain it away through rational means do not understand the message of how God can always provide for us in ways that we cannot. After the sermon came a hymn and prayers of intercession, followed by the sharing of the peace. After another hymn came communion, with the bread and wine being taken around the congregation and given to those who wished to partake. The bread was eaten upon being received whereas the wine was drunk collectively, as was the case at West Croydon. After communion came a final hymn, and the service ended with the Grace (II Corinthians 13:14) being said. The service lasted roughly an hour (I regrettably forgot to accurately time it). Tea, coffee, fruit squash and biscuits were served at the back of the church while members of the congregation chatted with each other. Many approached me to welcome me to their church. The church was founded in 1883 as a mission to the local community, housed in a tin structure. This was upgraded to the present brick building in the late 1930s. On its website, the church describes itself as “self-governing over its ministry, finance, membership and leadership, while remaining part of [the nearby] Sutton Baptist Church.” Originally administered by the Shaftesbury Society, responsibility for Crown Road was later transferred to Sutton Baptist Church, but I was unable to find out when this took place. The exterior of the church is not, in all honesty, very impressive. A plain rectangular brick building, one would not be able to tell it was a church if it did not have a noticeboard and a large “Crown Road Baptist Church” sign on the outside. While the interior is a little bland in some respects, I personally found it very charming. There is no religious imagery, no real decoration, just a stage with a cross and some flowers on it and the hymn numbers on a wall next to it, and yet for some reason I – being one who usually appreciates decoration in churches – did not find it too plain for my liking. The words “I am the way, the truth and the life” (John 14:6) are positioned above the stage, and a piano is next to it. On one side of the church is a table with some toys and some pictures drawn by a recent Girls’ Brigade event, and on the other is a table on which teas and coffees were served after the service. One of the most striking aspects was the size. The church is very small, giving it a rather cosy feel – it may have been this which made me somewhat appreciate the lack of decoration, as much more may actually have made it look crowded. The service was led by a male preacher in a shirt and tie, and the piano was played by a lady who also helped to lead the prayers. The psalm was read by a lady from the congregation. The congregation was the smallest of any church I’ve yet visited; including myself and the two at the front, there were only twenty one people in the room. The majority of the congregation was female – not including the preacher there were only six males – and I would guess that most were between the ages of thirty and eighty. In regards to the ethnic make-up of the congregation, I did not count, but I would say that there was roughly a 3:1 white/black ratio. Due to the small size of the congregation, there was a real sense of community – one may even say a sense of family – amongst them. 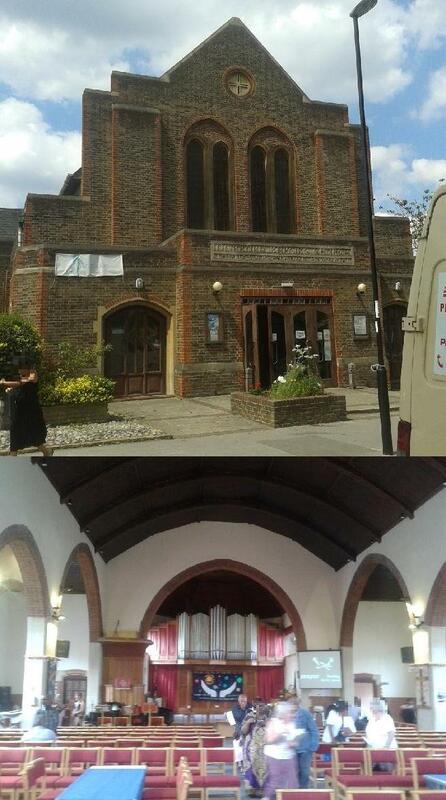 They were very friendly and welcoming, and I was warmly greeted by several of them both before and after the service. After the preacher introduced himself, we sang a hymn the words of which were projected on a screen which came down over the stage. After this came prayers, including the Lord’s Prayer. The preacher then showed us a short video on the projector screen which had the message of not giving up and being able to make a difference, and gave a short talk on those subjects. This was followed by a second hymn, after which the lady playing the piano gave some notices before an offering was taken. The preacher then gave the gospel reading, Matthew 25:19-25, part of the parable of the talents. Focusing on the third servant’s perception of his master, there was then a talk on our perceptions of God. After another hymn, Psalm 139 was read, and the preacher then spoke about God’s omnipresence and His work in our lives. After prayers of intercession for the world and for members of the congregation, the congregation was dismissed with a blessing following a final hymn. The service lasted an hour and ten minutes. After the service, tea and coffee were served at a table on one side of the room. Biscuits and slices of cake were also available. The members of the congregation chatted with each other, and several of them approached and engaged me in conversation before I had to go. The church building was constructed in 1873, with the local Baptist community having been founded in 1869. It was made a Grade II listed building in 1974. The church exterior is in what I believe is known as the Palladian style of architecture, with Victorian red brick. The interior, on the other hand, is rather plain. At the front of the church is a stage of sorts with drum-kits, flanked by staircases which lead up to an organ gallery. A projection screen is in the organ gallery, showing the congregation a live video feed of the front of the church and the words to the songs or Bible readings (the latter is also projected on the walls on either side of the stage area). In front of the stage is a table, on which were placed the elements for communion. A gallery runs around the sides of the church, supported by pillars. The sunshine streaming through the large frosted-glass windows gave the church a very bright feel to it. The service was lead by a deacon at the church, who explained that he was filling in for the regular pastor who that Sunday was preaching elsewhere. The Bible readings, sermon, and final song were led by someone else, a lady who I assume was a lay preacher of some sort. There was also another lady up on the stage who accompanied the songs with a violin – the drum kits were not used while I was there. The congregation numbered roughly 40 people. I think it would be reasonably accurate to say that half of the congregation was composed of white people in their 50s or older and the other half composed of black people in their 30s or younger – there were of course exceptions, but in terms of age and ethnicity this was the general pattern. There were slightly more females than males. The congregation were friendly, with members greeting me upon arrival and also talking to me after the service. There are two Sunday morning services. The first, at 9:15, was the one I attended, and is described on the church website as “a quieter, more traditional gathering” as opposed to the “lively” 11:00 service, described to me as much more “exuberant” by one of the members of the congregation. After greeting the congregation and leading an opening song (which was, unlike what I’ve experienced in the other Baptist services I’ve so far attended, somewhat unenthusiastically sung), the deacon leading the 9:15 service asked us all to greet each other. This was somewhat like the sharing of the peace, with the members of the congregation turning round to those near them and greeting them. After this, the deacon gave a short talk on Matthew 5:5, “Blessed are the meek, for they shall inherit the earth”. This was followed by some of Psalm 37, with the deacon saying some verses and the congregation saying others as responses. After prayers and another song (which was thankfully sung a lot more enthusiastically than the first one! ), there was communion. After reflecting on St. Paul’s instructions on the Eucharist, the deacon broke a loaf of bread and some of the members of the congregation came up to the front to take the bread and wine around the pews, with members of the congregation taking it if they wanted it. They were asked to eat the bread when they got it as a sign of their individual salvation, and to drink the wine together at the end as a sign of their joint membership of the church. Communion was followed by another song. After this, the deacon read out some notices and the offering was taken. There were then prayers of intercession for the church and the world, and then after another song this the deacon went and sat down with the congregation and was replaced by a female preacher. She gave the Bible readings, Matthew 6:1-4 and Genesis 4:1-8, and then gave a sermon on the topic of giving and of avoiding hypocrisy. After the sermon, she led the congregation in a final song before saying “the grace” (2 Corinthians 13:14) as a dismissal blessing. The service lasted about an hour and twenty minutes. At the back of the church was a table with tea, coffee, and orange squash available. There was also a plate of shortbread fingers and a box of chocolates. Several more members of the congregation approached me to speak with me and welcome me to their church. 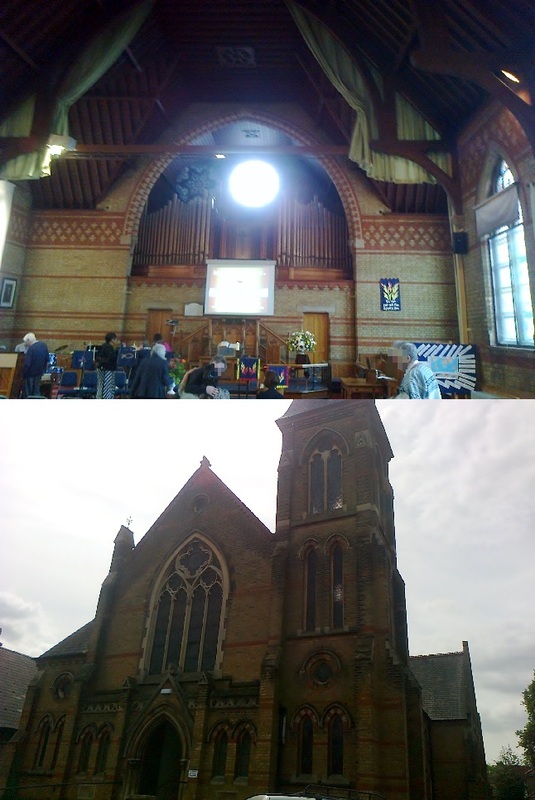 What is now Carshalton Baptist Church was originally founded in 1895 as a mission just over a mile away. In 1954, the congregation moved to Strawberry Lodge, an 18th-century Grade II listed building. A new church building built next to Strawberry Lodge was opened in 1969, but the congregation outgrew this and it was rebuilt in 1996, taking the form of the present building. Strawberry Lodge is currently hired out by the church as a conference centre. Despite being purpose-built as a church, the inside of the building looks a lot like a sports hall – I assume this is because it is probably sometimes used as one, going by the lines marked out on the floor. Honestly speaking, it did not look very much like a church to me, but more like a hall that was being hired by the church. There is a stage at one end of the hall/church, on which the pastor spoke and the band played. The stage is draped in dark blue curtains, with a pulpit of sorts at the front, which is below an overhead projector screen on which the words of songs were shown. Down on the main floor, in front of the pulpit, is a cross with a crown of thorns placed over it, and on either side of that are flowers. In a corner at the front of the church (not on the stage) is a table with a white cloth draped over it, from where communion was served. Other than a cross embroidered on the pulpit and the wooden cross on the floor at the front, there is no religious imagery in the church whatsoever – like I said, it looks more like a hall being hired out than a purpose-built church. However, that is not to say that the interior is “plain”; for example, there is a huge banner almost covering one wall which displays an advertisement for the church. There are also twenty large national flags hanging down from the ceilings in rows of four. These flags are of countries from around the world, but I have no idea why they occupy such a prominent place in the church interior – I can only assume that they are meant to signify either the universal message of the Gospel or the countries in which members of the congregation have their roots, but I can’t be sure. The service was led by a male pastor who led most of the prayers. There was also a band up on the stage who accompanied the songs with music, playing a guitar, electric keyboard, drum-kit and violin – the pastor himself played a saxophone with quite some talent. There were just over fifty people in the congregation, most of whom seemed to be young adults or middle-aged, with children and elderly people together not making up more than about a quarter of the congregation. The congregation was predominantly black, with about a third of other ethnicities, and a similar ratio applied to females and males respectively. I was rather struck by just how friendly the members of the congregation were, greeting myself and each other with real warmth and happiness. Several of them came up to me before the service to personally welcome me. Before the service started, the band on the stage were practising some of the songs which would be sung later. The service started at 10:30 with the pastor on the stage singing what I think may have been a greatly condensed version of Psalm 103, with which some members of the congregation attempted to join in with varying degrees of success, there being no words on the projector screen to follow for this first song. After this came some prayers, with members of the congregation offering their own after the pastor. This was followed by several upbeat hymns, all sung with a lot of feeling to them, some people clapping their hands or waving their arms in the air. After what was quite a long time of singing – probably between half an hour and forty minutes – notices were read out by the pastor. After the notices, a girl from the congregation came up to the stage and sang a song while collection plates for the offering were handed around. The children then went up to the front and were prayed for by the pastor before leaving to attend a Sunday school in another room elsewhere in the church building. After more prayers, communion was taken. Stewards went around the congregation with plates of bread and small glasses of wine, giving them to people who wished to take communion. More prayers were said, and then a reading was given, 2 Corinthians 12:1-10. The pastor then gave a sermon on the reading, reflecting on the struggles of St. Paul and speaking about struggles and setbacks that take place in a Christian life. The service was meant to finish at 12 o’clock, but the sermon was still ongoing at 12:15, meaning that I unfortunately had to leave due to time constraints of my own. However, fortunately I do not think that I missed much, as the pastor – aware that he was overrunning – had said that he was getting towards the end of the sermon, and I do not imagine that there would have been much afterwards, perhaps just a final song and a blessing. 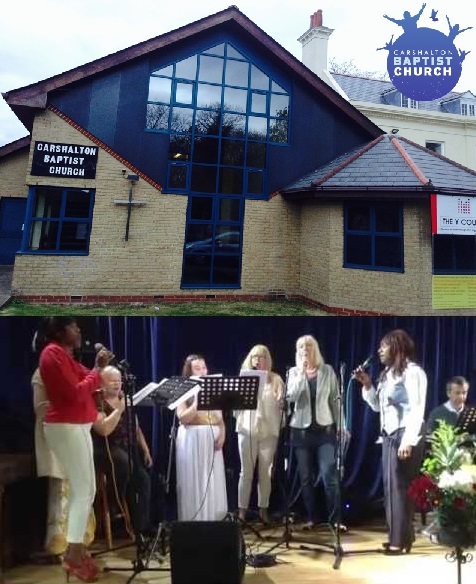 Although the songs were very upbeat, as at the service I attended last month at Wallington Baptist, unlike my experience there I found them here to be a bit too much so. The singing was so lively that it seemed almost as if, should you not be waving your hands in the air and swaying to the beat, you weren’t doing it right! It was also loud enough for me to barely be able to hear myself sing, and I was sitting at the back – it must have been even louder for those at the front by the drums. However, although the building was a bit too bland and the singing a bit too lively for my liking, the friendliness of the congregation was a real positive point to my visit. Due to the service overrunning and my having to leave before its end, I did not see what happened after the service finished. However, there were other rooms leading off from the main entrance of the church building, and the pastor mentioned during his sermon that cake is sometimes served at the church, leading me to assume that there would have been some sort of refreshments in another room afterwards. The church is built out of warm orange brick, inside as well as out. The inside of the church has a wooden ceiling, and stained glass windows with colourful patterns rather than religious imagery. A circular stained glass window is at the front of the church, displaying a Star of David – this is a symbol not often seen in Christian churches, and it may be used to represent the Trinity (two interlocked triangles), but I don’t know. The inside of the church is not richly decorated. A few banners hang on the walls, and there are two small memorials to the dead of each world war, as well as a photograph of who I presume is the church’s founder. At the front of the church, beneath faux organ pipes, stands a projector screen onto which the words of the songs were projected. In front of this is a table on which is placed a Bible and a candle, and in front of this are the lectern and music-sheet stands for the band. The service was led by a male minister helped by a female worship leader who led a lot of the songs and some of the prayers. There was also a small band at the front which played along to the songs and as members of the congregation were arriving for the service. The congregation numbered between 50 and 60, and were very friendly. I was approached by several people asking if it was my first time visiting, if I lived nearby, if I’d like to stay afterwards for coffee, etc. Elderly people, ethnic minorities, and children seemed to each make up just under a third of the congregation, and there was a good balance between male and female. The service (which started at 10:30) was, in the words of one of the people who welcomed me, “somewhat happy-clappy”. It was divided into three main parts, each lasting roughly half an hour. The first part consisted of several contemporary hymns being sang one after another, with breaks now and then for short prayers or talks. Members of the congregation would clap to the music, wave their hands in the air, and play on tambourines and maracas in time to the songs (or, in the case of the children, just play on tambourines and maracas). The second part consisted mostly of prayers, taking some different forms. Some were led by the minister, whereas others followed more of a “shout out what you want to say” format. Halfway during these, after a prayer for them, the children left to go into the church hall for a Sunday school type of meeting. The third part of the service began with a Bible reading, Philippians 2:1-11. This was followed by a long sermon by the minister, based around the reading and on how Christians should live in compassion, truth, love, etc. After a final song, the service ended with a blessing by the minister at around 12:00. Although I found the service to drag on a bit towards the end, overall I very much enjoyed it. The people there were very friendly and welcoming, and the singing especially was very uplifting. Members of the congregation went into a church hall after the service for coffee, although I could not join them due to time constraints. A few others – including the minister himself – approached me and spoke to me before I left, making clear that I was welcome and inviting me to visit again.